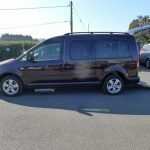 Another one of our Lewis Reed converted WAVs that can accommodate up to six passengers (including the wheelchair user) and ideal for family use. 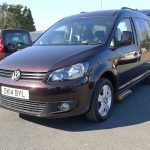 This Caddy has been finished in a gorgeous metallic blackberry and with rear privacy windows, alloys and front fogs its a lovely looking Volkswagen. 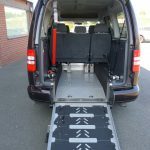 The adaptations in this wheelchair accessible vehicle have the wheelchair user very much in mind. 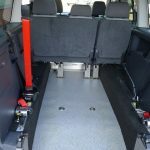 There are two docking positions to choose from – the first position is situated behind the rear seats so that if passengers are required to travel in the back along with the wheelchair user, this is the ideal location. 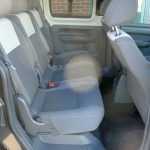 The second location is up front as the rear seats can all fold forwards and out of the way allowing the wheelchair user to be nearer the front passengers – the choice is yours. 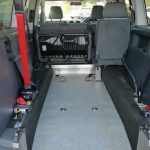 The wheelchair is fastened securely into the vehicle utilising the four point wheelchair restraint system and all that needs to be done is to click the safety belt around the wheelchair user and you’re ready for the off. A demonstration of this can be found under the ‘Advice’ tab above along with a wealth of useful information designed to guide you through the various types of vehicles that are available. 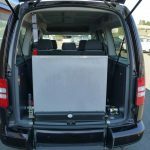 The blackout windows provide privacy for the rear passengers should this be a preference. 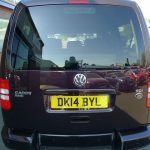 Lots of little extras too including drink holders in both the front and back plus a passenge side step should it be required. 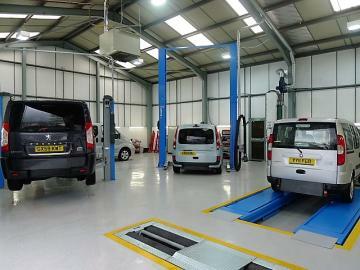 Air conditioning is also included and very nice to have on those warmer days and longer journeys. A vehicle that is lovely to drive and ticks all the boxes. The 1.6 litre diesel engine and manual gearbox provide plenty of power to get around in and with plenty of features to benefit all passengers – please check out the specification section for a full list. 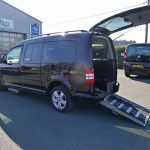 All of our quality wheelchair accessible vehicles come with 12 months MOT, 12 months warranty and are serviced and valeted in our very own state-of-the-art Service Centre.